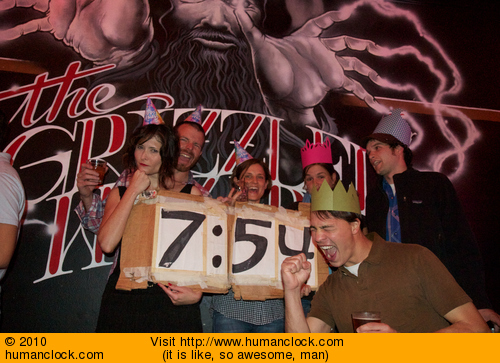 The Human Clock™: Turn on the 2010 news! Happy New Year! / Happy Almost New Year! 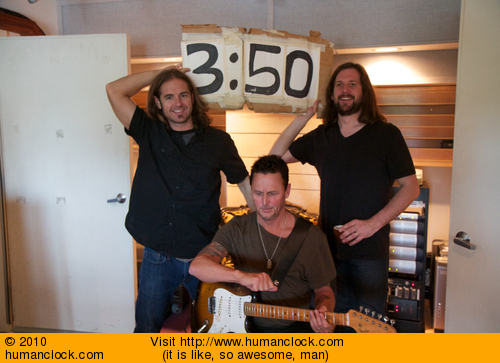 I took clock photos of notable session musician Greg Suran and his notable employer Liz Phair last night. 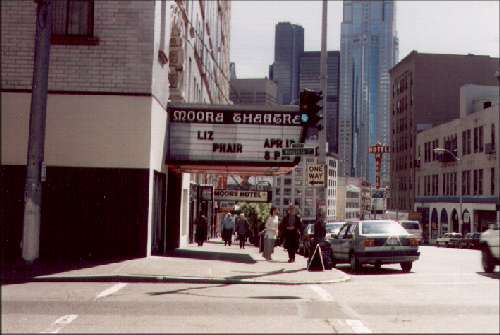 It was a really great show and quite a different experience from when I saw her in 1995, simply because this time I didn't have to spend the night after the show sleeping on the floor of the Seattle Greyhound Bus Depot. Chalk one up for getting older! Went to Bunk Bar and saw Robert Scott from the most excellent band The Clean. Speaking of which, I finally got all of my photos and videos from Matador at 21 online! Wow! What a weekend. Went to the Matador at 21 concert in Las Vegas. Had a lot of fun and saw a lot of music. 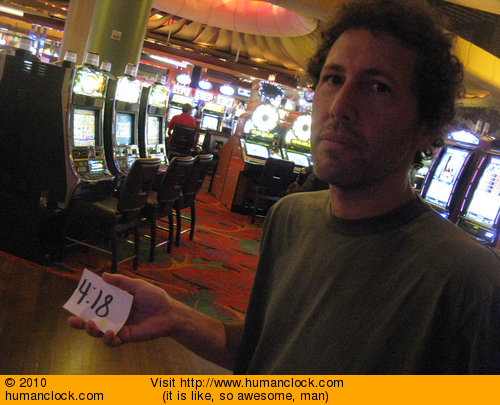 I ran into Yo La Tengo standing in the casino. 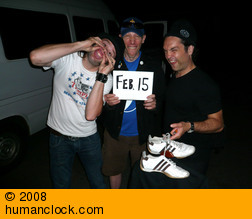 A few years ago a girl I know sent me a clock photo with their drummer Georgia. I went over to say hello (well, due to my "state" and enthusiasm..to them it probably looked more like Kool-Aid Man was busting through their living room wall). I bought a fancy new camera awhile back so I can at least look a little more like I know what I'm doing. The camera has a good knack for putting itself into unique situations. from the movie Crossroads. Maybe next time. 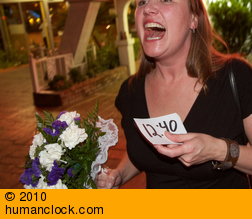 Lastly, thanks to Postcrossing for giving my Pobox Clock project a mention. 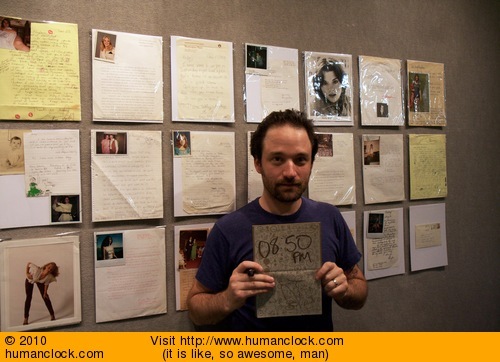 When I came up with the Pobox Clock idea, I didn't realize I was tapping into a huge network of people who semi-anonymously mail postcards to each other around the world via their website. Check their site out if you wish to receive postcards from real people around the world! Hey, I'm working on a new theme for the clock site, except rather than you sending me photos with the time in them...you mail me the actual time! 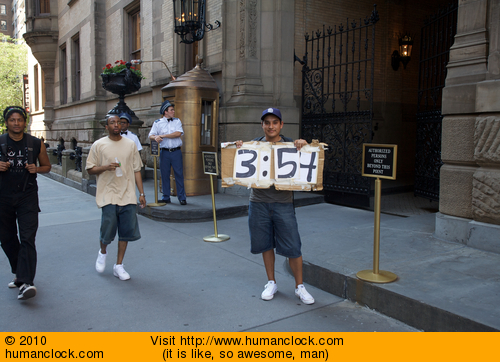 Details here about the Pobox clock. Greetings from New York City, NY. 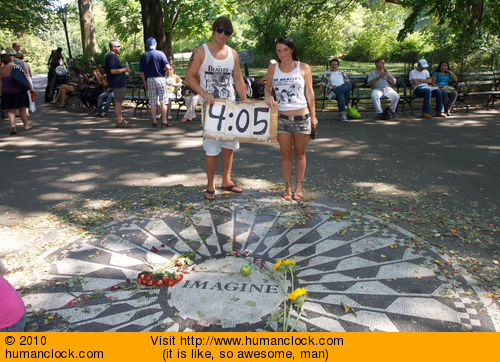 Went two a couple John Lennon related spots today and took clock photos of a few people. Went to see BSNYC read at Powell's bookstore tonight and got a couple clock photos of him (aka Eben Weiss). If you haven't read his blog and have even a remote interest in bikes it is well worth your time to check out. I think he won me over when he correctly pointed out that the musical group The Escape Club was created as a drop in replacement in the event that INXS' tour bus should ever crash. Unfortunately on the photo I took of Eben where he had a nice smile, my camera was more interested in a Nov. 1979 letter to Andy Kauffman, written by one Jayme McDonald from Renton, Washington, and focused on that instead. The letters in the photos are letters written to the late comedian Andy Kauffman and collected in this book: Dear Andy Kaufman, I Hate Your Guts! I'm really sad to say that my friend Tim Wallace unexpectedly passed away on Saturday, June 12th. He was "Mr. 2009" on the humancalendar.com website. I remember when I took his calendar photos the process was a minor nightmare due to lighting and computer problems. Tim just sat there in the booth and we told stories as I cursed the remote capture software on my computer. The whole process took about 50 minutes instead of the usual 20. This turned out to be a bit of a blessing because I had a video camera running the whole time, and it captured a regular conversation between us without any degree of formality. I will post a little bit of the video at some point. He was a great friend and I'll miss him a lot. I finally have the list of songs that mention a time all up to date, 953 songs as of this writing! Updating the list was a bit of a pain due to the huge amount of spam I had to clean out. I've made a few changes so it will be easier for me to administer the list going forward. The Bridgetown Comedy Festival is in town, and near my house! The last time something this exciting happenned so close to home was when the Flaming Lips did that naked video shoot up at Mt. Tabor. 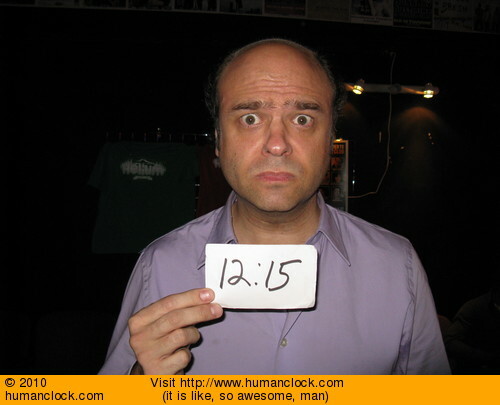 I've been seeing some great acts and last night I got a clock photo of Scott Adsit who plays Pete on 30 Rock. Holly Golightly & the Brokeoffs: "My 45"
"I still have to say that that is one of the best suits I have ever seen. It's simple and classy, and the cut is pretty timeless. It looks new and old all at the same time"
C) Lastly, the humancalendar.com site is on the "Wacky Websites" Page-a-Day tear-off desktop calendars as January 2nd. I just heard about this the other day which is a good thing because I was able to pick up two of them (one for me, one for me mum) for $1.99 off of Ebay since it is four months into the new year. 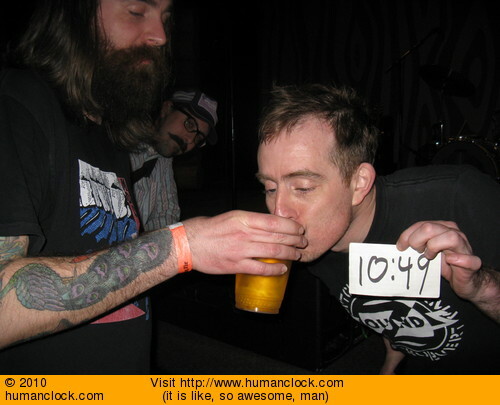 Got a clock photo of Ted Leo, pharmacist Chris Wilson, and customer Sweet Jimmy T last night. It was a great show! Work on the new clock site is progressing good, although I feel I'll be done sometime around 2024. 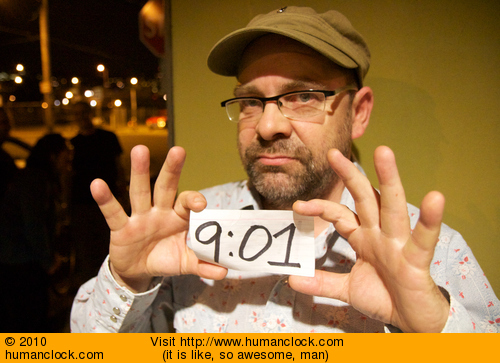 And yes, you will be able to put the clock on your blog! Anyway, if you are in the Portland, OR area this weekend you should really go see Star Anna. They are playing at the White Eagle here in Portland on Saturday, March 13th. 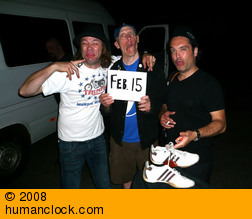 Famous Rock Stars and NPR have now found them so they won't be playing smaller venues too much longer. Plus sometimes they do a nice cover of Otis Redding's "That's How Strong My Love Is"
Humanclock.com / Humancalendar.com (websites) would like to say Happy President's Day (USA Holiday), from the Presidents of the United States of America (band) via Joanne Hendriks (nice person), who took these photos while they were on tour in Krenfeld, Germany (Country). I think the first time I saw them was in 1994 in Bellingham, WA at the Royal Room. I didn't know too much about them at the time, but during their song "Naked and Famous", a girl who I had a crush on started taking off her clothes. 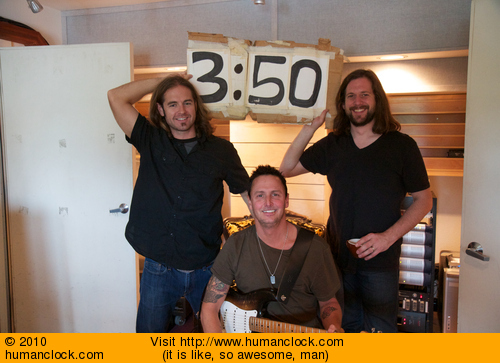 I thought to myself: "This band is quite alright."